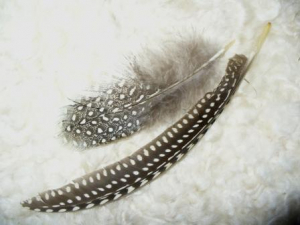 Observation - Guineafowl feathers - UK and Ireland. Description: Distinctive pattern; found near a farm that keeps them from where they regularly abscond. Not yet established a feral population. Distinctive pattern; found near a farm that keeps them from where they regularly abscond. Not yet established a feral population.